I went a little mad in Sainsbury's the other week, stocking up on lots of different fish for the freezer. Fish I wouldn't necessarily normally choose, such as swordfish. 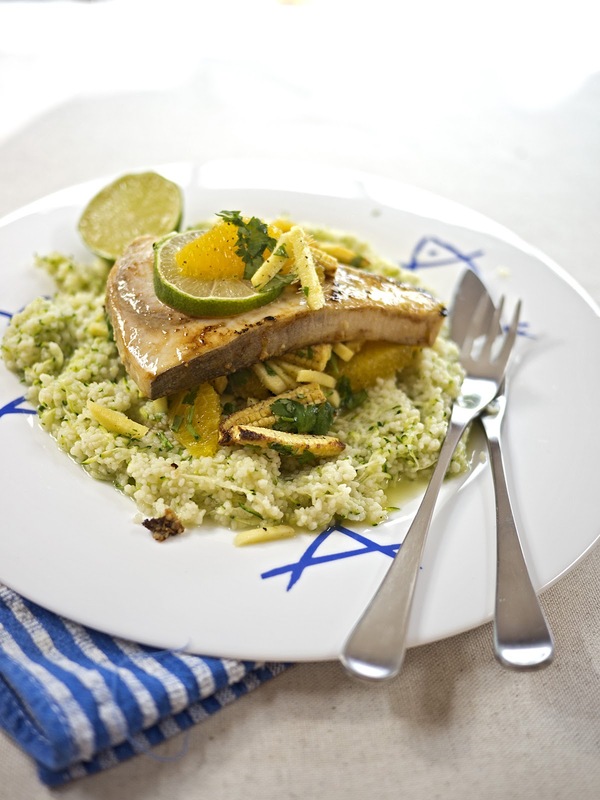 This recipe is adapted from a Ready Steady Cook dish, to fit in with the Slimming World plan. 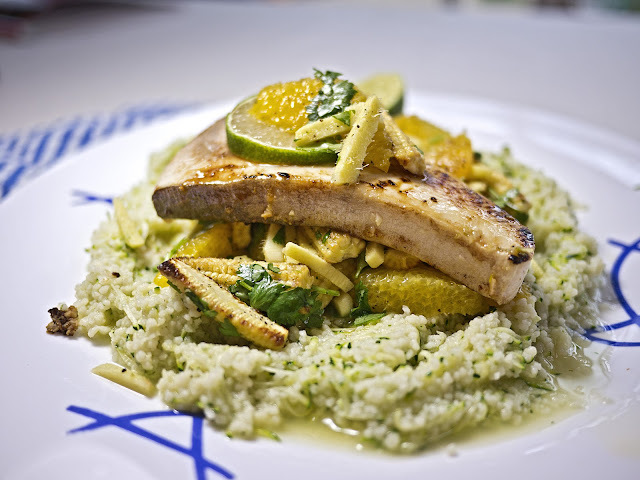 The orange and ginger went extremely well with the rich, meaty fish, and a green couscous completed the meal. Finely chop the garlic and mix with the lime juice and zest, soy sauce and chilli. Place the fish steaks in a shallow bowl and pour over the marinade. Turn to coat and leave to marinate for 10 minutes. Remove the skin, pith and membranes of the oranges and cut into segments. Cut the ginger into thin julienne strips. Halve the baby sweetcorn lengthways, then halve again crossways. Lay cut side down on a greased baking sheet, and spray with Fry Light. Grill on a high heat for a few minutes until beginning to go soft and slightly charred on the edges. Leave to cool. 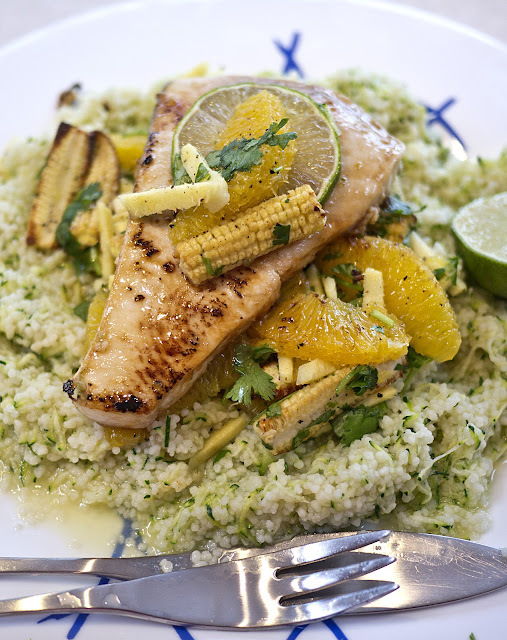 Mix together the orange segments, ginger, baby sweetcorn and coriander leaves. Cook the couscous in plenty of water with the the bouillon powder according to packet instructions. Mix in the grated courgette. I find this is much easier to do before draining. Remove the swordfish steaks from the marinade and fry over a high heat for a few minutes on each side until cooked through. Drain the couscous and place on two plates. Put the salsa on top of the couscous and finally top with the swordfish steaks. Serve with lime wedges for squeezing.